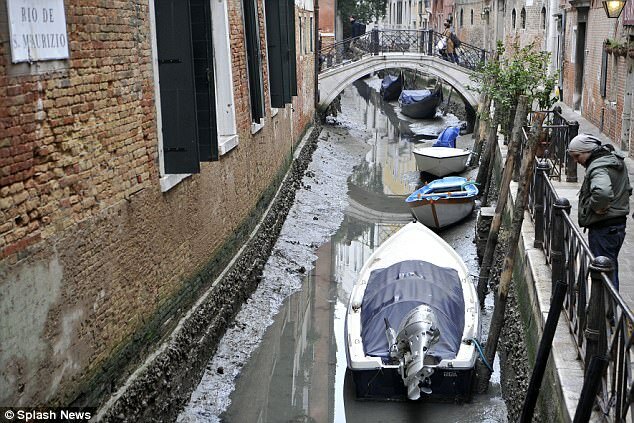 Unusual weather has left some of Venice's legendary canals dried out forcing gondolas to park up on dry land. Cold winter weather, low tides caused by the 'super blue blood moon' and little rain have caused the storied waterways to drop by up to 23in in some cases. Photographs taken this week have shown the Queen of the Adriatic looking a shadow of her normal self, with boats covered up and even languishing on the muddy bottoms of empty canals.